The lake trout used to be the fish to catch in the Great Lakes. But by the 1950s, severe overfishing and an infestation of an eel-like, blood-sucking parasite called the sea lamprey had drastically reduced the number of lake trout and other fish. Then, a fish called the alewife invaded the Great Lakes through man-made canals. Without enough lake trout to keep them in check, alewife populations exploded, and have since varied wildly year to year. Dead alewives have been spotted washed up on beaches in piles stretching miles along Great Lakes coasts. In a 2011 interview, Tanner said he saw the alewife as simply a food source for a predator fish. His experience as a fish biologist out west told him that Pacific salmon would do the trick. And, it would be spectacular. Salmon fishing has been incredibly popular in the Great Lakes ever since, but the Great Lakes ecosystem continues to change. The alewife has almost disappeared in Lake Huron. Salmon fishing collapsed there, prompting charter boat captains to move over to Lake Michigan. “I loved Alpena, but with the fish collapsing, there was no way you were going to pull anybody up there. You know, when Rogers City took a dive, and that was quote-unquote 'the salmon capital of the state' for years. And when it died, everything just petered right out out there. There was just nothing left." Now it appears Lakes Michigan and Ontario are headed in the same direction as Lake Huron. Salmon is still popular, but the DNR stopped stocking them because their food source is dwindling. The invasive zebra and quagga mussels are having an impact on the Great Lakes as well. Sara Adlerstein-Gonzalez is a fisheries scientist at the University of Michigan School of Natural Resources and Environment. Adlerstein-Gonzalez thinks that what we’re seeing is actually the ultimate success of Tanner’s plan. The alewife population collapsed as intended, and now the salmon don’t really have a role to play. She says the lakes are returning to a “more oligotrophic stage, which is more natural, and native species are starting to come back." She says that lake trout and walleye are both making a comeback. Another native species, the whitefish, never actually experienced a dip in population, according to Adlerstein-Gonzalez. “They even adapted to feed on the zebra mussels, which is pretty amazing,” she says. “They seem to be more resilient." Adlerstein-Gonzalez co-authored a study, published in the journal Ecosystems, that suggests that wildlife managers should focus their efforts on the restoration of native fish. Salmon may be popular, but Adlerstein-Gonzalez says that popularity may need to take a back seat to sustainability. “The sustainability of a system depends on the function, and the native food web was a sustainable food web. So why would we need to be intervening in these ecosystems all the time to make it what we want for a certain sector of the population?" she asks. 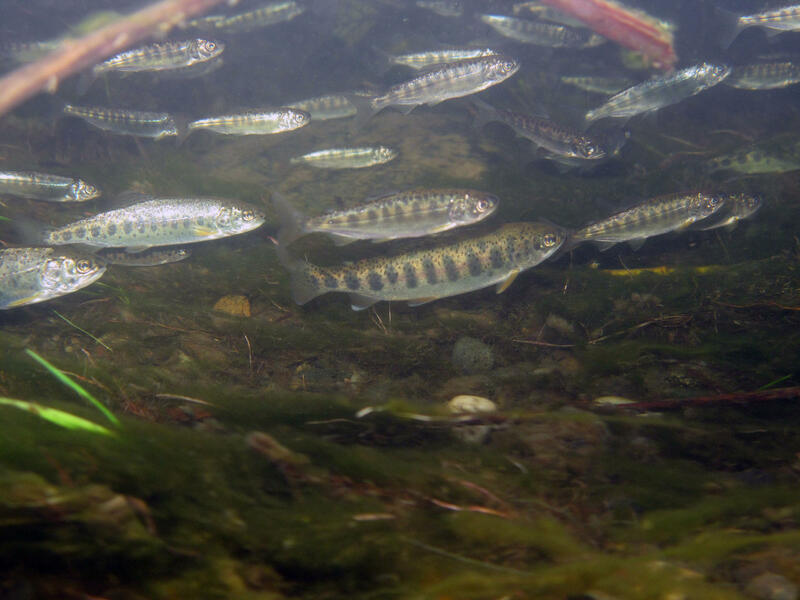 When the DNR announced a few years ago it was looking at reducing the number of salmon being introduced to the Great Lakes, some wondered why they didn’t just add more alewives to the system. But in Adlerstein-Gonzalez’s eyes, that’s more of a Band-Aid than an actual solution. "I have ... been amazed to hear the fishermen pushing for a solution, quote-unquote, for their recreational fishery. Well, the productivity is low, so even if you would put more chinook salmon, even if you would try to put alewives, now the system is a different system, right? The native food web was adapted to the original condition. So what is the limit? … You need a productive system that will sustain all the other natural food web,” she says. To fully understand what’s happening in lakes like Lake Michigan and Lake Ontario, Adlerstein-Gonzalez says we simply need more time to observe. “In order to predict what you're going to see in a system, you need to have good data. Food web models are really good at integrating that information to give you some ideas of what you can expect, but if you don't have good data, you can't do that,” she says. For now, Adlerstein-Gonzalez tells us that fisherman might just need to let go of the salmon and get used to fishing for native species. “There's nothing wrong with that,” she says. “Totally the opposite. I think maybe a little bit of education is necessary, so the fishermen understand what it means when they catch a chinook salmon or a lake trout. "Maybe they feel happier if they know that lake trout is a good fish to have around, and maybe they will not insist on having what doesn't belong to the Great Lakes in the first place." You’ve probably heard about the big bad invasive silver or bighead carp, also known as Asian carp. But there’s another invasive fish that’s roughly a third the size of the carp that’s already done a lot of damage to Great Lakes fisheries. Alewives have been a particular menace in Lakes Michigan and Huron. 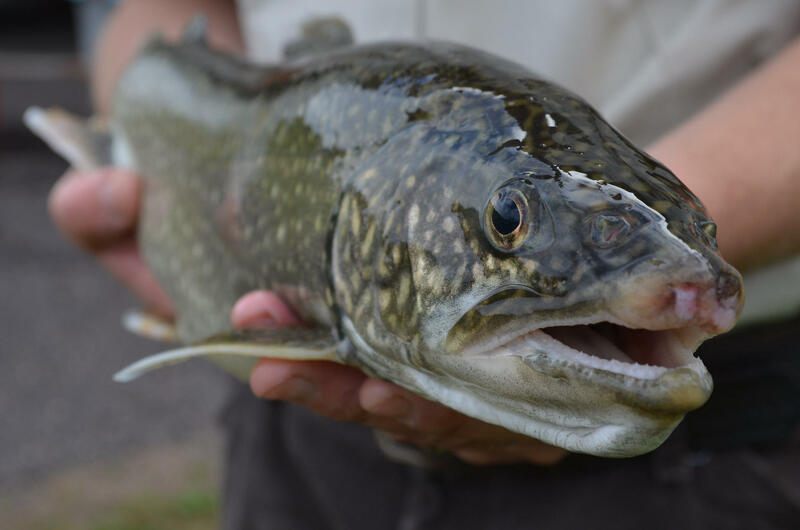 The invasive fish cause all kinds of problems for native lake trout. Alewives scarf down lake trout eggs and very young fish. But even once lake trout grow big enough to turn the tables and eat the alewives, the invasive fish still cause problems.